If you're shopping for a preschooler this holiday season, then take a look at these 17 toys that are fun and also educational . You can click on the pictures to learn more about each toy. Block Buddies comes with 21 different wooden shaped blocks, and 50 design cards for kids to replicate. Replicating design cards out of blocks promotes visual perception (processing and understanding visual information), visual-spatial skills (figuring out where an object is in relation to another), and sustained attention. Kids can also build their own structures, enhancing their creativity and using their imagination. Gertie Balls have an interesting tactile surface (feel slightly soft, sticky and mushy). They are fun for any child but are especially cool for children who seek out extra sensory input. This ball is also a little easier to throw and catch than a regular ball. Construction Truck Sort and Match comes with picture cards and 3D magnetic pieces to replicate the designs with. Working on a vertical surface promotes fine motor skills while searching and matching pieces encourages visual processing and attention. Shelby's Snack Shack is one of my favorite board games for preschoolers. To play spin the spinner to determine if you will be picking up any doggy bones, then spin the 2nd spinner to determine how many. Use the tweezers to pick up the number of bones shown. Using tweezers to pick up objects helps strengthen hands. Developing hand muscles is important for holding and manipulating small objects (pencils, buttons, eating utensils). Design and Drill is a popular toy for preschoolers. Kids use a power drill to re-create designs on picture cards or create their own designs. Design and Drill promotes eye-hand coordination, visual processing, bilateral coordination (coordination of both hands), dexterity, and attention. Pretend play helps with language development, social-emotional skills, and self-esteem. It is super important for preschoolers' brain development and cognition. 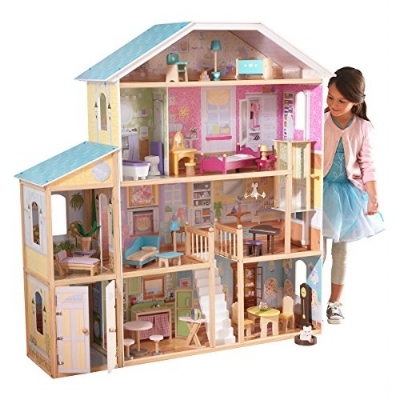 So, what better way to encourage imagination and pretend play than with this beautiful realistic looking wooden dollhouse?! This musical set comes with color-coded song sheets and 8 handbells that each play a distinct note. Exposing kids to music and musical instruments helps develop language, auditory processing, and teaches relaxation and self-esteem. Also, following song sheets to play music encourages sustained attention, color recognition, and visual processing. Tegu wooden magnetic blocks come in many variety packs. Playing with Tegu blocks enhances motor skills, imagination, creativity, and coordination. Arts and crafts play an important role in child development. They promote social-emotional development (sharing, patience, grit), cognitive development (counting, color and shape recognition, problem-solving, and creativity), and motor development (fine motor skills, bilateral coordination, in-hand manipulation) to name a few. Paper Plate Bugs comes with a variety of buttons, stickers, pipe cleaners and more for preschoolers to turn colorful paper plates into creative bug creatures. This beautiful wooden toy kitchen includes 14 eating utensil accessories and is just perfect for encouraging pretend play and imagination in preschoolers. Kids on Stage is a fun game that helps build communication, creativity, problem-solving, and self-esteem. Kids have to get up and move in different directions while acting out words on the cards provided. Castle Logix is a one-player strategy game that helps develop spatial reasoning, visual processing, coordination, and problem-solving. The goal is to assemble the wooden blocks and towers to match the pictures in the booklet,which increase in levels of difficulty as they progress. Play Shapes are super cool rubberwood building blocks that are specifically designed for creating unique characters and structures, and building imagination. Build It! is an excellent engineering toy that is simple enough for young kids to make on their own. It includes 15 pieces that can be turned into either a boat, a car or plane. Build it! 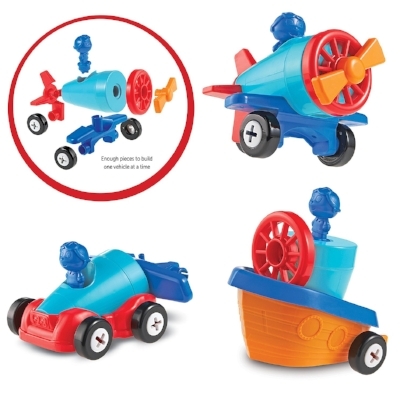 encourages problem-solving, motor skills, sustained attention, and helps build self-esteem. Suspend Jr. is one of my favorite board games for preschoolers. It promotes turn-taking, attention, color and shape recognition, eye-hand coordination, and dexterity. You play by spinning the spinner and placing the color pieces onto the rod without letting them fall. 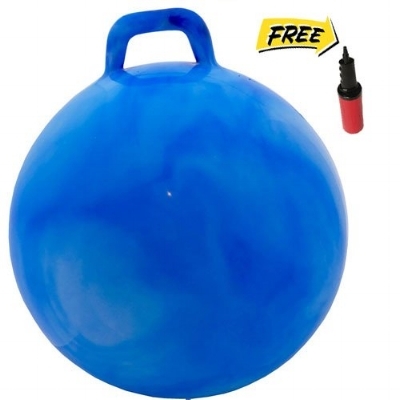 Kids love bouncing on Hop Balls, but these balls have additional developmental benefits as well. They teach balance, coordination, and provide sensory (vestibular) input that many kids crave, which can help with focus. They can also be used to work on core strength and improve posture.